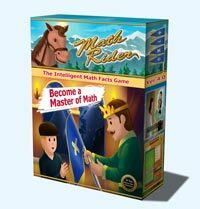 "The Intelligent Math Facts Game - MathRider"
Build Confidence in Math - Right from the Start! Stop the painful struggle and equip your child to master the fundamental building blocks of math. Many high school children are held back because they never mastered their math facts. Do not let your son or daughter become one of them. MathRider's unique combination of game play, storytelling and reward system, coupled with a learning artificial intelligence system ensure that your child will completely master addition, subtraction, multiplication and division. All in the one fun game. Press play on the video below to find out more. To get your own trial copy of MathRider, simply enter your email address on the right and click the "Get the Trial" button. We will generate a trial registration key for you and email it to you, together with the product download link. Imagine the feeling of success your child will experience when they receive the final award from the king himself, indicating they are now master of addition or whatever operation they have been playing. The trial registration key will give you 7 days to try out the full-featured MathRider. Enough time for you and your kids to decide whether you will it will work for you or not. And if you decide to purchase the game, all player statistics gathered during the trial period will be retained and remain available - your kids will NOT have to start from scratch. So go ahead and fill in the form on the right and get the trial now. We will send you detailed download and installation instructions, together with your evaluation key, enabling all the features in the software for the duration of the evaluation period. The first thing that happens with MathRider is that the software "learns" what your child has already mastered and where additional practice is needed. You can then simply continue with MathRider or use other means of assisting him or her - the choice is yours! Because our software hones in on areas that need further practice, just a few days of practice is all it takes to see some marked improvements with many children. MathRider features a highly configurable "Practice" Mode. This mode allows "free practice" in that it is not connected to the statistics engine. Instead it allows you to choose any individual number, range of numbers and operation to be practiced, as you see fit. This practice mode will remain available to you even after the evaluation key has expired. So MathRider will be useful to you even beyond the evaluation period. We will also send you tips and tutorials that you can use in the future, whether you choose to purchase the software or not. You can unsubscribe from these tips at any time. If you require any support with the MathRider software during your evaluation, feel free to contact our support team any time using the contact form available via the on-line help or by simply replying to the installation email. I have to tell you, that my 9 year old was SOOO improved after just the 7 day trial. Also, he is no longer scared of math, and willing to TRY new/ harder stuff. Where as before Math Rider, if I would bring up math he would mentally shut down! Thank you for trying MathRider, the intelligent math facts game! Register here for your free 7-day trial of MathRider. Simply enter your email below and we will send you your registration key and download instructions.